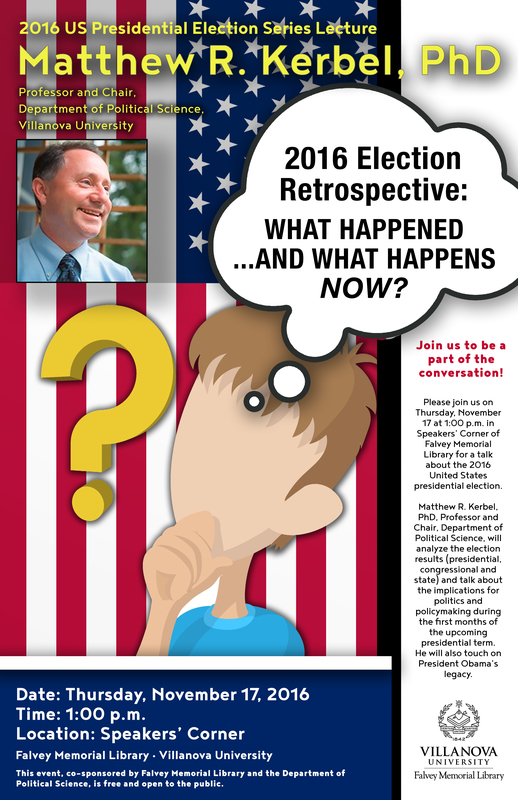 Falvey Memorial Library :: 2016 Election Retrospective: What Happened—And What Happens Now? 2016 Election Retrospective: What Happened—And What Happens Now? Dr. Kerbel is a well-known expert on political communication – the use of traditional media such as radio, television and newspapers, and new media such as social media, blogs and web sites. Kerbel has been a television and radio writer for the Public Broadcasting Service. He is often interviewed about political communication and serves as an expert source for the Constitution Center. This event, co-sponsored by Falvey Memorial Library and the Department of Political Science, is free and open to the public. Beyond Persuasion: Organizational Efficiency and Presidential Power (1991). Choosing a President: The Electoral College and Beyond (2002). Edited for Television: CNN, ABC, and American Presidential Elections (1998). The Elections of 2000 (2001). Get This Party Started: How Progressives Can Fight Back and Win (2006). iPolitics: Citizens, Elections, and Governing in the New Media Age (2012). Party On! : Political Parties from Hamilton and Jefferson to Today’s Networked Age (with John Kenneth White) (2012).